Blue Sky Fibers Dawson Shell Pattern - Woolly&Co. 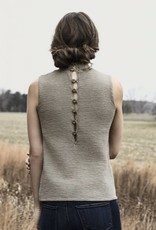 Wear the Dawson Shell with a jacket or on it’s own showing the pretty back detail and clever arm shaping. In crisp Organic Cotton (Skinny), the body is worked in stockinette, the mock turtle in plaited basket stitch and a simple crocheted back button closure.